First up for today, it’s a (very) basic set of Twilight Isles maps – hopefully enough to get everyone oriented. To forestall the inevitable silly question, the lettering is not actually a part of the landscape. For the maps with grids on them, each square is fifty by fifty miles. They’re at a higher resolution than will fit into this column though, so the actual players are encouraged to take a closer look. White – no surprise – indicates the more-or-less livable islands. The vast majority of these are volcanic, and of relatively recent origin. A few islands seem to be made of older rock however, and there have been a few reports of sunken ruins in various oceanic locations. Thanks to the fact that the light of the Jav-Sabok seems to be very good for plants, the islands tend to be luxuriant and highly productive, despite the relative thinness of the new soil. Black indicates Sieltufan – columns of rock which rise out of the ocean and ascend straight to the Jav-Sabok. Their true height is unknown, as is what’s on the top. They are conduits for massive flows of elemental energy, apparently derived form the Jav-Sabok, and are quite dangerous to approach; doing so is like sailing directly in to a permanent magical storm. Their near-vertical sides are rough, jagged, overrun by plant life, and often host dangerous magical wildlife. They are, however, astoundingly rich in magical materials – so occasional foolhardly adventurers do try to visit and exploit them. Blue, naturally enough, indicates water. The light of the Jav-Sabok encourages plant growth in the seas just as well – if not better – than on the land, leading to features such as the Sea of Weeds (where the light is especially intense), and to quite a variety of small “islands” which consist of either masses of floating plants or are actually tree-like plants rooted in the seabed and growing to extend well above it. 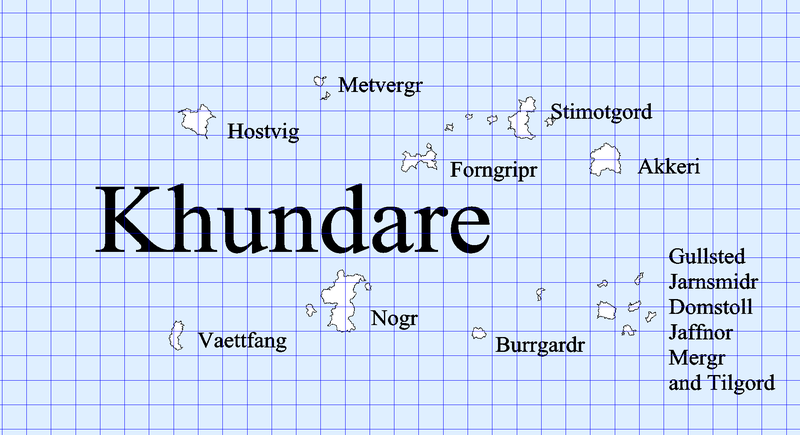 Such “islands” are, however, usually too small to show up on the large-scale map. Perhaps more importantly, the vast abundance of phytoplankton support equally vast schools of fish and many larger sea creatures – making the seas both dangerous and a primary source of food and protein for the inhabitants of the Twilight Seas. 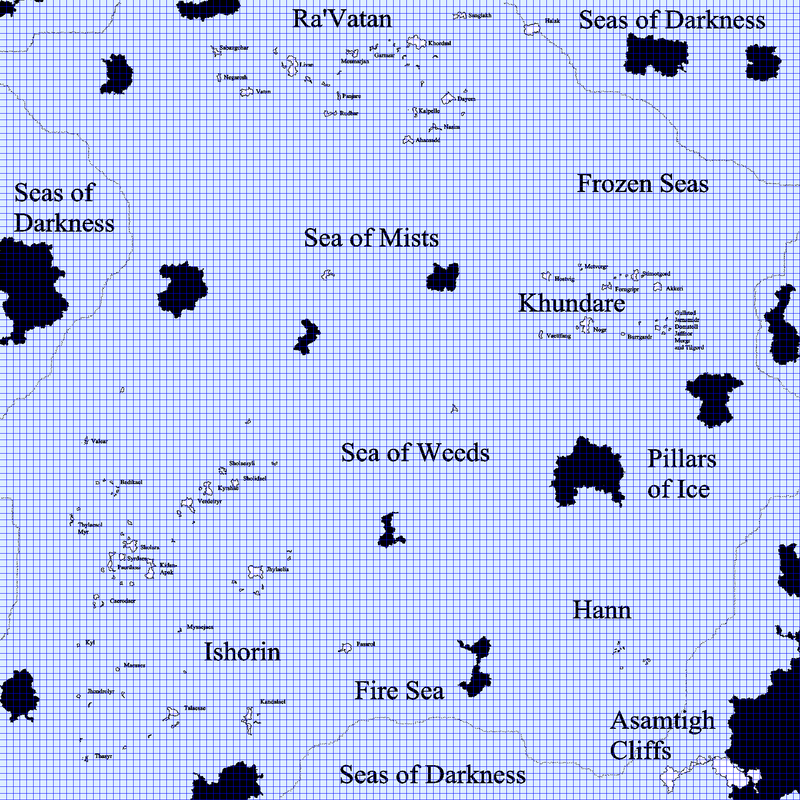 The Seas of Darkness are pretty simple: over these regions, the Jav-Sabok fades into occasional sparkles of light. The areas are predominantly cold and barren, extending for unknown distances. Some explorers have reported masses of ice, others have reported barriers of Sieltufan, and most of those who have made it back have reported terrible monsters and swarms of undead. It is popularly believed that beyond the Seas of Darkness all existence fades into a formless sea of chaos. This is probably wrong. Hann is a tiny cluster of small islands inhabited by an equally diminutive race – albeit one with a powerful talent for commanding animals, including the creatures of the sea. For the most part, the Hann are left undisturbed; their small territory simply isn’t particularly attractive to others and their defenses would be formidable even if they weren’t so isolated. Perhaps unsurprisingly due to their positioning between the Fire Sea and the Pillars of Ice, the Hann climate is wildly variable. The Sea of Mists steams beneath the full power of the Jav-Sabok, which raises dazzling streams of mist from the heated waters. The area is poorly explored, and may well host a considerable number of usable islands – however, the storms here are especially intense, and spawn exceptionally large numbers of monsters. Between the heat, the navigational difficulties, and the monsters, most sailors prefer to give the Sea of Mists a wide berth, especially since it’s also rumored to be the usual home of the Great Beasts. The Sea of Weeds grows where the light of the Jav-Sabok is intense, but not yet great enough to raise clouds of vapor – an ideal growing situation for seaweed, which drifts here in great masses. According to legend, many ships have been lost here forever, with their crews reduced to skeletons animated by unnaturally-active strands of seaweed – but outside of the fact that ships do go missing here with slightly greater frequency than they do elsewhere there’s no real evidence to support the tales. The Pillars of Ice are iceburgs which break off from a solidly-glaciated area of the Seas of Darknes, and are kept from melting too rapidly by the cold winds that blow from those same seas to replace the columns of heated air rising from the Sea of Mists. The area is dangerous, bitterly cold, and – as far as anyone knows – quite useless. What land there is is so buried under ice that it is nearly impossible to tell it apart from the iceburgs. A few hidden tribes are supposed to live in this area, but the reports are pretty scattered. The Asimtagh Cliffs rise near-vertically at least three thousand feet from the sea, in the darkness, and are coated with ice from the bitter cold. Atop them is a plateau – or at least so it’s said – where the ruins of some ancient civilization can be found, along with any number of elder horrors. The Fire Sea has a considerable number of highly-active volcanic vents, which produce magma, blasts of superheated steam, and toxic or flammable gases, in roughly equal measure. The area is extremely dangerous and little-explored. Ishorin is dominated by the Shadow Elves. It’s the largest archipelago, and nation, in the known world. 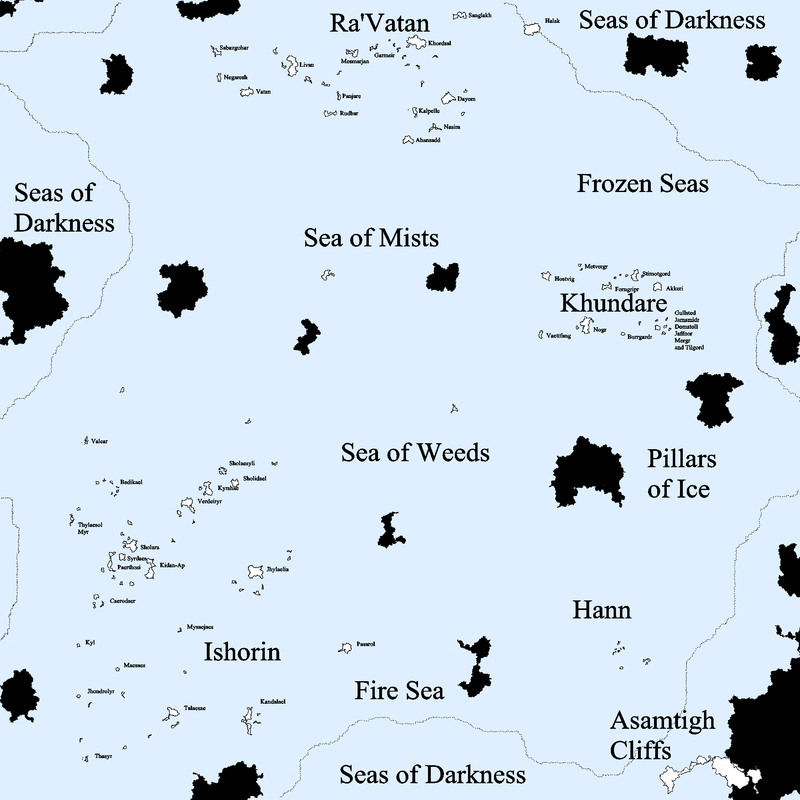 It does have a few Ikam Dzer and Thunder Dwarf settlements in the mountains of the larger isles however, as well as occasional Veltine mercenaries, raiders, and slaves. Free Veltine rarely settle in Ishorin however, they tend to find it’s semi-tropical climate too hot and humid for comfort. 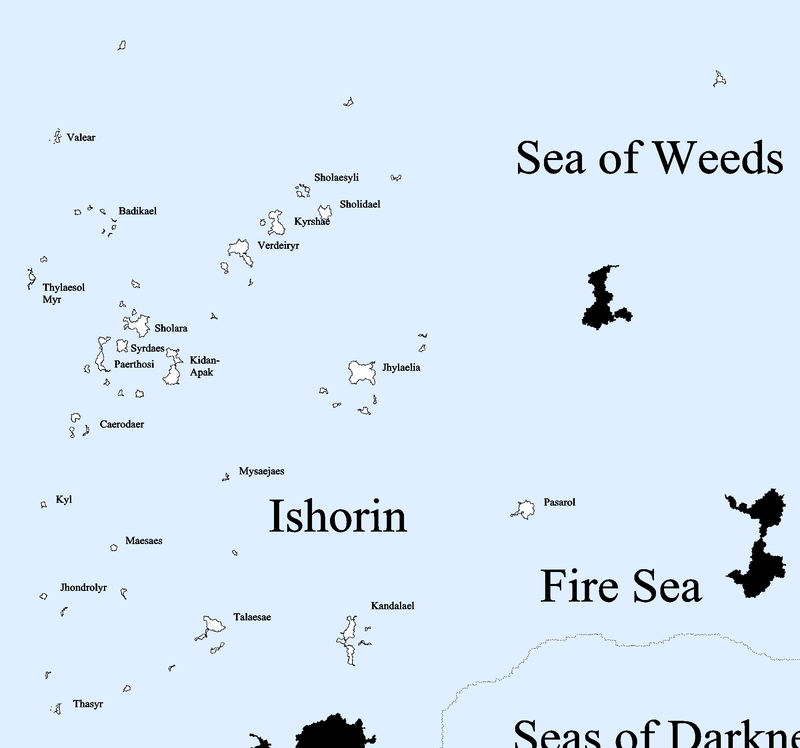 The characters are currently based on Valear, a small island on the upper left. 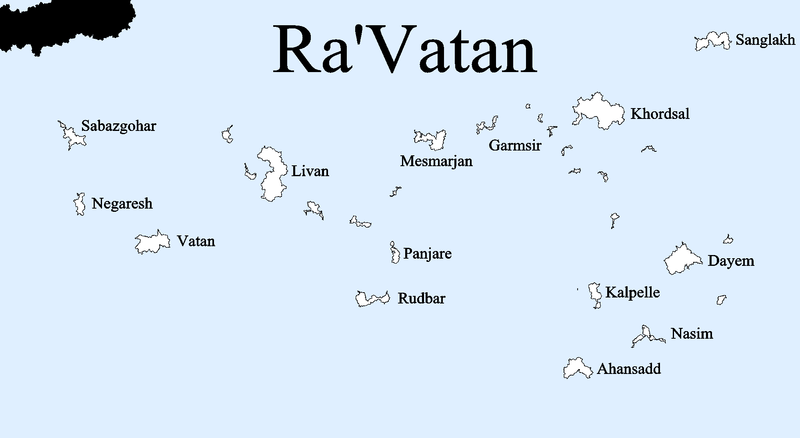 Ra’Vatan is populated primarily by the Thunder Dwarves and Ikam with a scattering of Shadow Elves and Veltine occupying the shoreline. 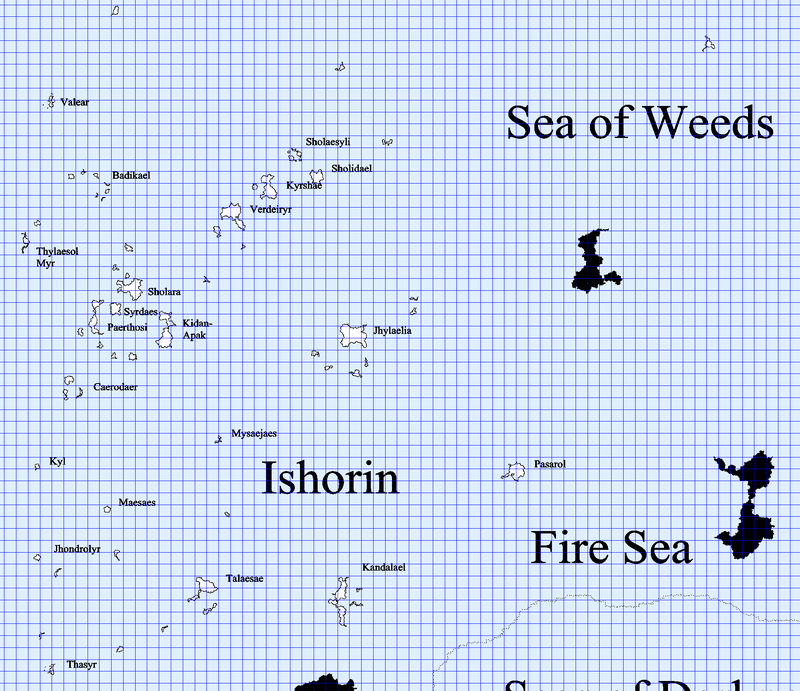 While it’s a considerably smaller archipelago than Ishorin, it’s also far more tightly grouped and includes a larger number of islands made of non-volcanic stone. The climate is generally temperate, although quite rainy. 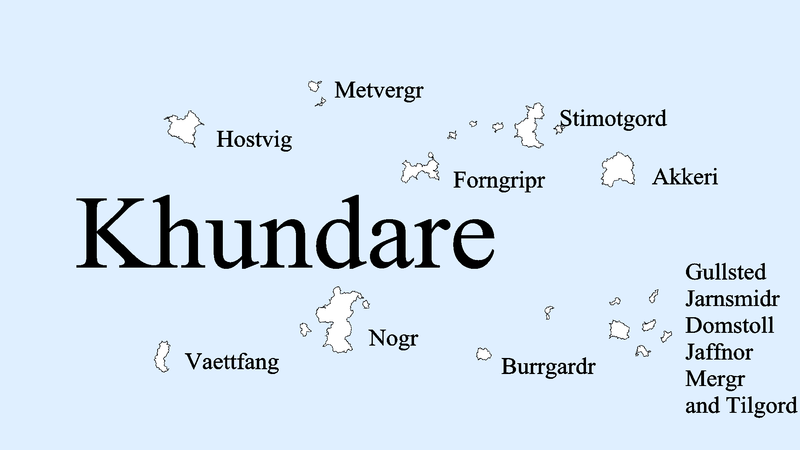 Khundare is a small archipelago populated almost exclusively by the Veltine, although a few outposts of the other races can be found here and there. For the most part, the Shadow Elves, Thunder Dwarves, and Ikam find the local climate is uncomfortably cold at best, and prohibitive at worst. Oddly enough, Khundare has fewer dangerous creatures than most of the other regions; the Veltine tend to be more than a match for simple predators – although it’s not too uncommon for them to try to visit the nearest Sieltufan – which they call Nardrasyl – to prove themselves and seek adventure.